"The Constitution states that the national symbols of Ukraine shall be the National Flag, the National Emblem and the National Anthem. The blue and yellow flag as the national flag of Ukraine by the Supreme Rada in 1992." In Sweden there is a story going around, stating that the blue and yellow of Ukraine come from the blue and yellow of Sweden. When King Carl XII of Sweden (he was king 1697-1718) went to war against Peter the Great of Russia, he made allies with the Ukrainians, who wanted sovereignty from Russia. The Ukrainians should therefore have taken up the colours of Sweden as their colours. However, I don't know if there is any truth in this story. According to Album 2000 [pay00] - National Flag and Naval Jack (CSW/CS- 2:3) - Light blue over yellow bicolour. Ukrainian state flag was adopted on January 28, 1992 by Decree No 2067-XII of the Verkhovna Rada (=Supreme Council = Parliament). Other dates (January 21, 1992; September 3, 1996) are incorrect. Now the Ministry of Justice prepared new project of law about the State symbols of Ukraine. But it isn't still adopted. Resolution of September 4, 1991 gave only possibility to use Ukrainian National (blue and yellow) flag during the official ceremonies - before the adopting of new State flag. Please note, in former USSR we had the term "State flag". So, in that case "National flag" was not a "State". But final Decree, named "About the State flag of Ukraine" was adopted on January 28, 1992. Number of Decree is 2067-XII. Official publication in "Vidomosti Verkhovnoyi Rady Ukrayiny" (Official bulletin of the Supreme Council of Ukraine) was in No. 19 (1992), article 257. 4 September 1991 is the date when blue and yellow flag was first flew at the building of the Supreme Council in Kyiv (together with flag of the former Ukrainian SSR). But Decree of the Presidium of Supreme Council about using of blue and yellow flag was adopted on September 18, 1991 (No 1567-XII). Literally in text: "Allow to use blue and yellow flag in all official ceremonies until the adopting of Constitution of Ukraine". This Decree doesn't include ratio or other details of flag. De-facto, it abolished former State flag of the Ukrainian SSR, and proclaimed a blue and yellow as temporary official flag. Decree of January 28, 1992 proclaimed a blue and yellow as the State flag of Ukraine. Darker or lighter colours of Ukrainian flag haven't any political significance. According the legislations we have SYNIY (blue) and ZHOVTYI (yellow) colours, but our society also accept darker (for example - marine blue) or lighter (light blue) colours. 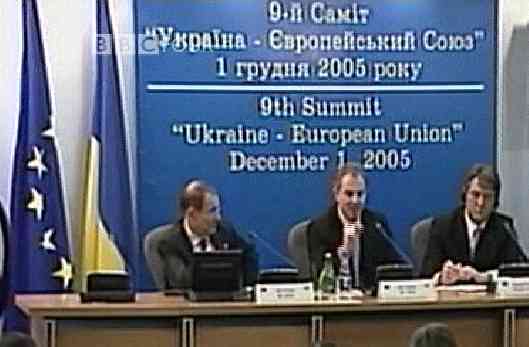 In his role as the current President of the Council of Ministers of the European Union, British Prime Minister Tony Blair has been touring eastern European capitals to try to resolve the problems with the E.U. budget. A report on 'The World' last night on BBC4 showed him speaking at a meeting in a location which wasn't specified, but, from the panel on the wall behind him, was clearly connected with Ukraine if not actually in that country. I was struck by the colours of the Ukrainian flag next to the E.U. one in this photo. There may indeed be no political significance to the colours, at least in an internal Ukrainian party sense, but I can't help feeling that their similarity to the dark blue and gold of the E.U. flag isn't a coincidence! I saw today in German TV ZDF this variation of Ukrainian national flag with the national symbol in the left upper corner. The flag was on a demonstration against the "results" of the presidential election. Today I saw on TV the 1:2-version of this flag. The flag of yesterday has really 3:5. The yellow of the logo is the same as the yellow of the stripe. This variation of Ukrainian flag was in project of the New Constitution (1997). But finally the Parliament (Verkhovna Rada) accepted our proposal - without image in the left upper corner. So, some people use variations of national flag (with Trident at shield or with Trident) during holidays, meetings etc. On this page a variant of the flag of Ukraine is shown with an incorrect version of coat of arms in canton: the colors are reversed and a white border added all around.